What follows is a column, and is opinion. All statements of fact have been attributed to sources. I have to say this because Taser is a highly litigious company that does not take kindly to criticism, as you shall see. Not surprisingly, Taser executives are adamant about the safety of its products — ask one and they’ll likely bring up the “hundreds” of Taser shots they’ve taken themselves over the years. In fact, Taser is so proactive in painting the image of its products as safe that it offers to shoot anybody who approaches the company’s booths at trade shows — an offer that ABC News reporter Amanda Congdon took up at CES this year in one of the show’s most memorable moments (an act that Jon Stewart called “Look-at-me-reporter-crap”). This would be great, if it weren’t a spin on the facts. A quick call to the Phoenix Police Department revealed this statistic to be highly misleading. However, for the sake of balance it must be noted that Kelly, as well as other law enforcement officials I spoke to, say Tasers have an important place in law enforcement when responsibly implemented. Of course, it is only logical that having access to a weapon less lethal than a gun would prevent deaths. This statistical manipulation, though, appears emblematic of how the company handles data related to the safety and effects of its devices. I come from a family of scientists and was raised to believe that the peer-reviewed system of verifying and disseminating scientific data is the best we have. From a personal standpoint, the most offensive actions from the company are undoubtedly its practice of suing medical examiners as well as researchers who have published peer-reviewed reports critical of Taser’s products. Not only does this violate the good faith of the scientific community, but it has a chilling effect on research — discouraging scientists from even touching related studies out of fear of retaliation. This was confirmed by a number of scientists who refused to speak to me on the record regarding Taser out of fear of reprisals. Taser’s lawsuits include cases against medical examiners in Indiana and Ohio who cited Taser-induced electrical shocks as the cause of death. But perhaps most striking is the case of James Ruggieri. In early 2006, Ruggieri published an article in the peer-reviewed Journal of the National Academy of Forensic Engineers. The study, “one of the few scientific studies of Taser’s electric jolt in which the company did not participate,” as The Arizona Republic put it, concluded that Tasers were far more powerful than the company acknowledged and that the devices are capable of causing fatal heart rhythms. Not taking the criticism lightly, the company sued Ruggieri for defamation, claiming he lacked the expertise to make such judgments, even though his story passed through the rigors of the peer-review screening process. While the number of completely independent studies on the dangers of Tasers is limited, some of the ones that do exist suggest they are anything but harmless — particularly in regards to their effects on the heart and the nervous system. 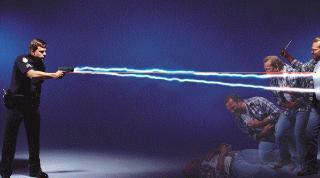 And then there are the effects of Tasers on the human brain and nervous system. Although there is very little research on this, studies have been conducted examining the effects of electrical shocks that are virtually identical to the ones delivered by Tasers. These studies suggest such shocks can cause serious, and potentialy long-term, damage to cognition and the central nervous system. Even Taser’s harshest critics acknowledge that being shocked is highly preferable to a gunshot. The problem seems to be that in its proactive presentation of the products as nearly-harmless — through a combination of suing critics (effectively silencing potential critics), controlling relevant research, and offering Taser shocks to anybody who passes by its booths at conventions — the public perception of Tasers becomes one of a device that is entirely non-lethal, making their misuse inevitable. Just ask Mustafa Tabatabainejad. from the static shock of walking across carpet or combing their hair. Kroll also asserts that TASER has never sued a peer-reviewed researcher.